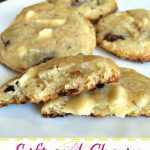 These Soft and Chewy Chocolate Chip Cookies are causing serious addiction, made with white and dark chocolate. Perfect dessert or snack if you manage to make them without eating the entire bowl of dough! Mix the butter, the sugar and the light brown sugar. Whip them until the mixture is white and airy. Add the egg and mix them well. Mix the corn starch, baking soda, salt and vanilla with the butter mixture. Add the flour and the chocolate chips and mix everything together. Put the mixture in the fridge for 10-15 minute. Form balls from the dough or use an ice cream scoop. Put 6-8 balls to a baking sheet. Bake them on medium-low heat for 8-15 minutes (depends on the size of your cookies). Or until they golden brown and you can lift them off the sheet without breaking.